1. Kf2! Bringing in the king. 1. Kxf1 fails to 1… Ba6. The other option 1. Qxf1+ only draws because the light squared bishop covers too many squares to create an effective mating net. 1… Bg2 Covering the threat of Qxf1+, Qg1+, Qg3#. This also allows the queen to get in the game from a7. 2. Bf3 Reinforcing the threat of Qxf1+ with mate. Black must respond with 2… Qg7 With everything good to go, Black can expect a draw, right? 3. Qh4+ Extremely critical. 3. Qxf1+ is truly tempting, but after 3… Kh2 4. Qg1+ Kh3 5. Bxg2+ Kh4, all Black needs to do is trade queens to draw. While a computer might see white as having the initiative, good luck finding the win over the board! 3… Nh2 This is the critical position. How can white possibly continue? 4. Qh8!! Brilliant! 4… Qxh8 allows 5. Bxg2# So the Black queen must not be deterred from protecting the g-file. It should be noted that both 4. Qh7 and 4. Qh8 are much less precise because 4… Qb2+ is possible, making the position messy. 4… Qg6 5. Qh7 Not 5.Qa1+? as after 5…Nf1, the line transposes to the same Qxf1 variations as mentioned before. 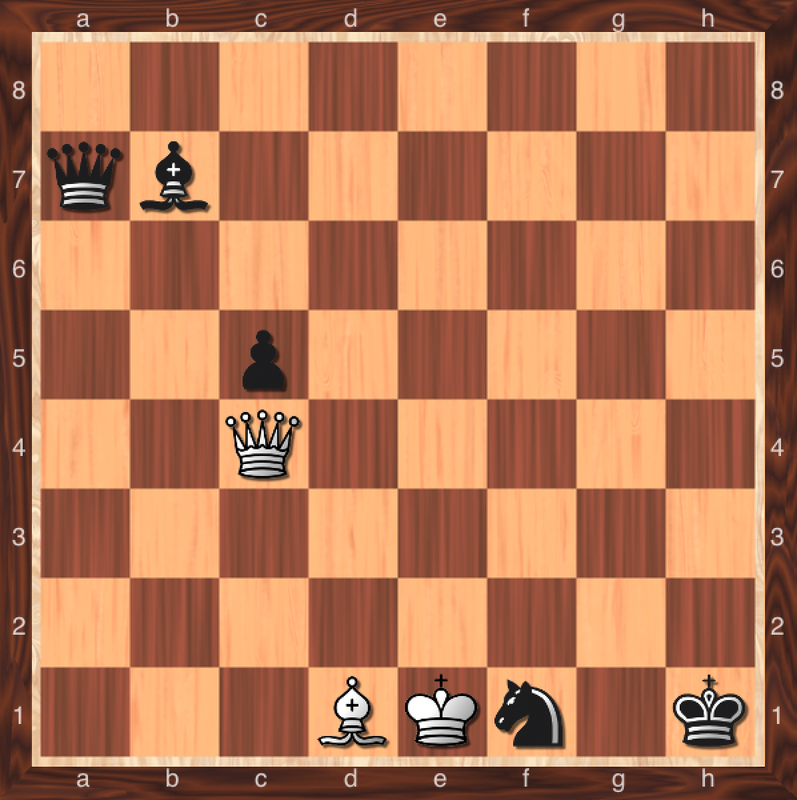 5…Qg5 6.Qh6! The point of this maneuver. Now after 6…Qg8 7. Qc1+ is winning because 7…Nf1 and now, after much waiting, 8. Qxf1+ Kh2 9.Qg1+ Kh3 10. Bxg2+ Kh4 11. Qh2+ Kg5 works because the white queen skewers the black king to his queen. 12. Qg3+ 1–0. Chess Season is Coming Up! What’s in Your Plans?